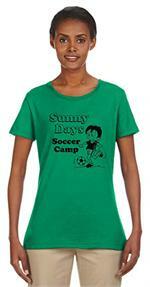 Custom imprinted Ladies' cut 100% cotton preshrunk jersey colored t-shirts. 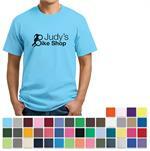 T-shirts are available in over 40 colors. 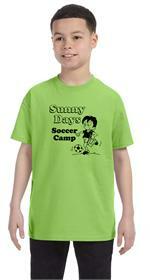 Custom imprinted 100% cotton preshrunk jersey colored Youth t-shirts. 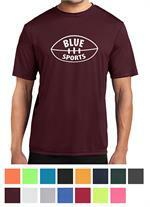 T-shirts are available in over 40 colors. 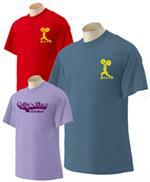 Jerzees® Heavyweight Blend T-shirt is 50% pre-shrunk cotton and 50% polyester. Our 29M Men’s style is available in 44 colors. 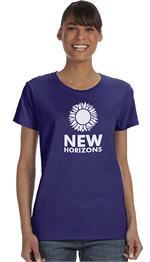 Jerzees® Heavyweight Ladies' Blend T-shirt is 50% pre-shrunk cotton and 50% polyester. 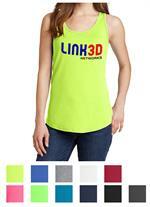 These tees are slightly contoured for a flattering fit with a feminine neckline and sleeves and comes in 18 colors. Sizes S-3XL. 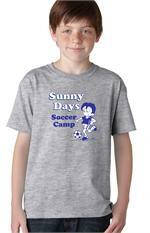 Jerzees® Heavyweight Youth Blend T-shirt is 50% pre-shrunk cotton and 50% polyester. These tees are available in 44 colors. Sizes XS-XL. 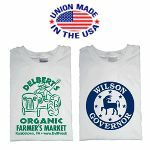 Gildan® Performance™ tee is made of 100% polyester jersey knit with Aqua FX® wicking properties and Freshcare® anti-microbial properties. Our Pro-Weight™ Tees are made of 5.2 oz. 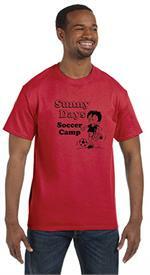 100% pre-shrunk cotton and have short set-in sleeves and taped neck and shoulder seams for durability. Prices range from $6.19 to $4.29 ea. 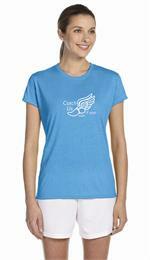 #6004C Bella + Canvas® Ladies’ The Favorite Tees have shoulder taping, are side-seamed and have a longer length and a slim fit. Please contact us for today's lowest prices! Port & Company® 5.4 Oz.100% Cotton long sleeve tees have a tag-free label. Prices range from $10.49 to $8.25 each. District Made® Men's Perfect Tri™ 3/4-Raglan Sleeve, athletic inspired design in a cozy 4.5 oz. 50/25/25 Poly/Ring Spun Cotton/Rayon blend with a tear-away tag. Prices range from $13.19 to $11.50 each. 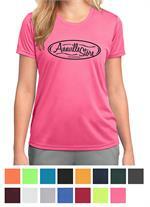 District Made® Ladies' Perfect Tri™ 3/4-Raglan Sleeve, athletic inspired design in a cozy 4.5 oz. 50/25/25 Poly/Ring Spun Cotton/Rayon blend with a tear-away tag. Prices range from $13.19 to $11.50 each. These V-Neck tees fitted for a curved silhouette and are made of 4.3 oz. 100% pre-shrunk ringspun cotton. Two-needle hemmed sleeves and bottom won’t unravel! Prices range from $9.49 to $6.79 each. 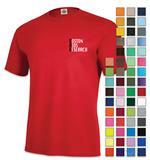 The Port & Company® Essential Performance Tees are made of 3.8 oz. 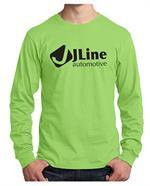 100% Polyester Dry Zone® moisture-wicking technology and have a tag-free label. Prices range from $9.69 to $7.59 each. 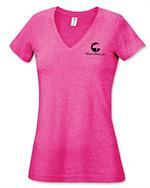 The Port & Company® Ladies' Essential Performance Tees are made of 3.8 oz. 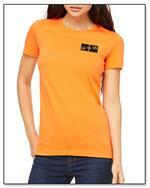 100% Polyester Dry Zone® moisture-wicking technology and have a tag-free label. Prices range from $9.69 to $7.59 each. 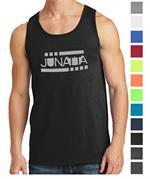 The Port & Company® Core Cotton Tank is made of 5.4 oz. 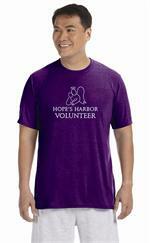 100% Cotton and has a removable tag for comfort. Available in Men’s and Ladies’ cuts. Prices range from $9.99 to $8.00 each.